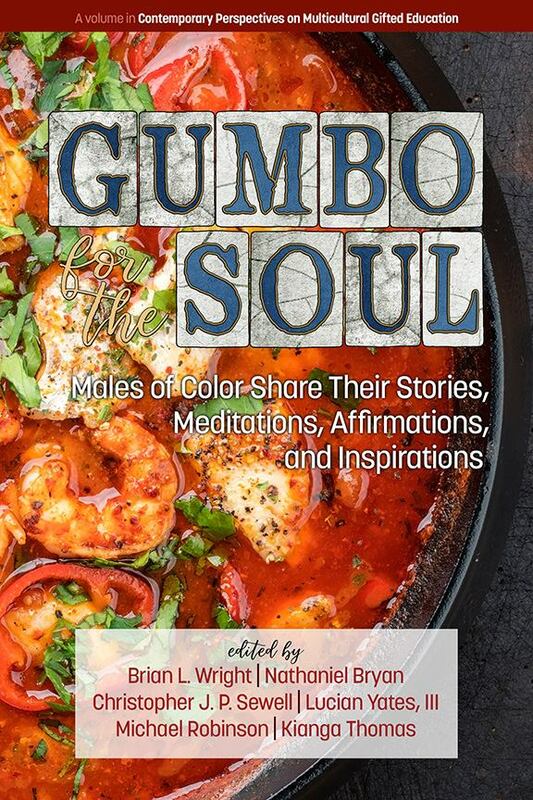 Dr. Mike Robinson: Why did you decide you share your story in the soon to be released book Gumbo for the Soul: Males of Color Share Their Stories, Meditations, Affirmations, and Inspirations? Brandon C. S. Wallace: I decided to share my story to simply empower and encourage the next generation (and some of the current ones, too) of male educators of color. I had no narratives expressed or shared with me through the lens of men of color. Of course, you see movies like Lean on Me, but you rarely get to see or hear another brother talk about his trajectory—the good, the bad, the pain, the growth, the beauty, the ugliness, the entire story—you don’t get to experience that too often. I wanted to make sure that men of color, who so nobly serve their communities in urban, suburban, rural, and even global capacities would be able to read a narrative and find some kind of connectedness to the incredibly amounts of work that we all do for learners of varying abilities and exceptionalities. Dr. Mike Robinson: What do you hope the readers of your chapter take away after reading your story? Brandon C. S. Wallace: I hope readers take away simply this: you will make it. Structurally, the educational system is, in many ways, technically and normatively designed to be less support of males of color—for both students and teachers. The disproportionality found within special education concerning Black males is deplorable (Skiba et al., 2006). The blatant treatment and the disregard of the Black-male intelligentsia to, far too often, be relegated to be the disciplinarians and behavior technicians—knowing that we have more to offer than keeping the students that look like us in compliance (Brockenbrough, 2015). You will make it through the disappointment, the racism, the reverse-sexism, the micro- and macro-aggressions, the anti-blackness remarks, etc. You will make it, and you will be so much stronger for the weight of world that prays you will bend and break under all the pressure. You will make it. Dr. Mike Robinson: How do you live your triumphs/victories in a way that empower other people of color? Brandon C. S. Wallace: I would like to think that I live out my victories and triumphs in such a way that empowers all people, including people of color. It makes me proud when I have males of color in my coursework, and I can enact the dispositions that reflect a deep level of content expertise and a myriad of experiences to help strengthen the theoretical, legal, social, spiritual, economical, and relational components that are typically associated with education, especially within specialized education. I don’t let any type of aggression slide anymore. I expose them for what they are. I live out my victories and triumphs to extend the idea of strength to those who feel like they are being chased down by fear and pressure of an imbalanced system. I want to empower people, specifically men of color, to command your heart (your passion for education) to overcome the pain of some of the pitfalls that come with this field. Once your heart is really in your work—you can make some incredible impacts on the lives of people. In short, and in the great words of the Notorious B.I.G., one of the greatest lecturers and artists of all time, “Stay far from timid, only make moves when your heart’s in it” (Wallace, 1996, disc 2, track 8). Brockenbrough, E. (2015). “The Discipline Stop” Black Male Teachers and the Politics of Urban School Discipline. Education and Urban Society, 47(5), 499-522. Skiba, R. J., Poloni-Staudinger, L., Gallini, S., Simmons, A. B., & Feggins-Azziz, R. (2006). Disparate access: The disproportionality of African American students with disabilities across educational environments. Exceptional Children, 72(4), 411-424. Wallace, C. (1997). Sky’s the limit. [Recorded by C. “Notorious B.I.G.” Wallace]. On Life after death. [CD]: New York, NY: Arista Records. Professor Brandon C.S. Wallace serves on two national assessment committees, specifically as an English/ language arts (ELA) and Accessibility, Accommodations and Fairness (AAF) committee appointee for the Partnership for Assessment of Readiness for College and Careers (PARCC) and Standing Reading Committee appointee for the National Assessment of Educational Progress (NAEP). Brandon is a curricula writer, national public speaker, presenter, and author, whose most recent piece entitled "For Special Educators Who Have Considered Giving Up When the Rainbow is Enough: A Retrospective and Prospective Essay on Being a Black Male in Specialized Education,” is one of over 50 compelling stories of triumph from Men of Color in the newly released Gumbo for the Soul: Males of Color in the newly released Gumbo for the Soul: Males of Color Share Their Stories, Meditations, Affirmations, and Inspirations (edited by Brian L. Wright, Nathaniel Bryan, Christopher J.P. Sewell, Lucian Yates, III., Michael Robinson, and Kianga Thomas. Mr. Wallace has received many awards for his teaching, most notably the Diane Tobin Award for Excellence in Teaching from John Hopkins University’s School of Education and the Award for Professionalism from Montgomery College.